This past weekend, our church held its annual retreat. Due to the hellacious nature of traffic in our area, families arrived at the conference center at different times throughout the afternoon and evening, depending on their route and whether the traffic gods were smiling on them. This year, our family arrived pretty early in the evening (#grateful more than #blessed). After we unloaded our car, we were sitting around the campsite, and phones began to ding around us. It seemed that some of our church friends were stranded after a nasty car accident on their way to the retreat. Could someone come and get them? Of course, the phone dings turned into texts and calls, and everyone sprang into action to get this family where they needed to be (namely, with us). We all knew that this family had been through quite plenty already this year: cancer, post-cancer reconstruction, and wisdom teeth removal to add insult (and injury) to injury. The car accident was just another turn of bad, bad luck. The one (and possibly only) upside to the whole situation was that the family was stranded at Buc-ee’s, a giant gas station chain based in Texas. 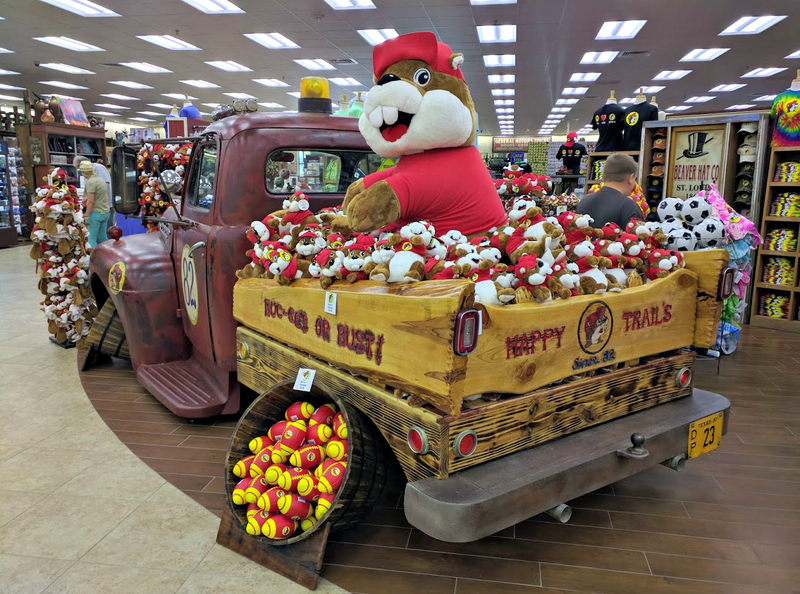 Buc-ee’s is known for the absurdly huge size of its stores, its clean bathrooms, the ridiculous assortment of meat jerky, and its mind-numbingly vast array of merchandise. 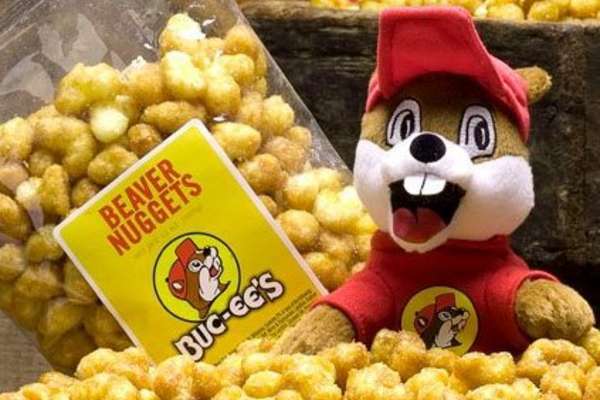 You can buy a Texas-shaped waffle iron there, or a tie-dyed football with the Buc-ee the Beaver mascot on it. You can buy candy and ice cream and beer and “Don’t Mess with Texas” signs, or even a cast iron pan if the mood strikes you. There is an alarming amount of patriotic “art” featuring oil fields. (I’m using the term “art” loosely.) We’ve been known to stop at Buc-ee’s just for the experience of it, but more often than not, there’s something that we “need” there, too. (Again, I’m using the word “need” loosely.) The Buc-ee’s location near our church camp is somewhat renowned among us as being The Place We Stop When We Go To Camp. And so, when we heard that our family-in-crisis was at Buc-ee’s, we all breathed a sigh of relief. Number one, they were safe and not sitting on the side of the road. A close second: clean bathrooms and plenty of snacks. Last but not least, we knew other members of our church community would be passing through there throughout the evening, and sure enough, other church families just happened to be there at the same time. These other families divided up the food, belongings, children and carseats from the wrecked car, and everybody got to camp safely, if a bit rattled. The helpers were almost a bit giddy at the chance to help. The next morning, as we continued the retreat, we heard from John Newton about living in a grace-filled community, and what that might look like at our church. It might mean giving up some of our grasp on being in control. Sometimes that grasp is whittled away slowly, and sometimes it’s whacked right out of us by a random piece of road debris, causing our lives to careen even further out of control. Either way, it’s during those times that we need a grace-filled community the most. My great-grandmother used to say that “We can stand any times but the good times.” I think she meant that we all tend to band together during hard times. Those hard times can be a sobering reminder of our fragile humanity, and a graceful (grace-full) community can echo the Grace shown to us by God in Jesus. Throughout the rest of the weekend, the opportunities to show grace to one another abounded, and it was never when things were going exactly as planned. When the campfire wasn’t started at the appointed time, we sang campfire songs in the dark. (Who doesn’t love the opportunity to sing loudly without being seen?) When a little girl got up to dance for the variety show, but changed her mind at the last minute, we all sang “Let It Go” from Frozen with her. (Our emcee for the evening reminded us that that was a true act of love. And it was lovely.) Those little slippery moments where things weren’t exactly going according to plan were the moments when we were at our very best. Even so, of all the things a person can find at Buc-ee’s, I never imagined there would be grace and comfort there, the way our friends found it on Friday night. But it does seem to show up in the unlikeliest of places. We will falter and mess up this grace-filled community, because that is what humans do. Just as the broken world is full of broken humans, so is the Church. And when we do mess this up, the cross shows us forgiveness–and the most unlikely places will continue to show us grace.